Oil prices have remained near to record highs of $78 a barrel after Israel intensified its attacks on Lebanon. Growing international tension over the hostilities and concerns about their impact on regional stability also hit stock markets around the world. US markets dropped in early trading, shares having closed well down across Europe and in Japan. Oil producers body Opec said it was concerned with the price spike but stressed the market was well supplied. The price of a barrel of US, light sweet crude settled at $77.03 having hit a high of $78.40. Brent crude, meanwhile, gained 58 cents to settle at $77.27 having hit a high of $78.03. Israel continued to bomb targets within Lebanon after the abduction of two soldiers by the militant group Hezbollah. Although neither Israel nor Lebanon are oil producers, the violence has increased tensions in the Middle East, a region which accounts for about a quarter of the world's oil. 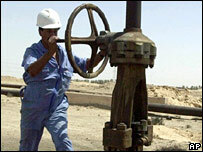 Analysts said oil could soon move above $80 a barrel if there was no imminent end to hostilities. "If this carries on, you can see the oil price going to $80," said Elissa Bayer, a director at stockbrokers Insinger DeBeaufort. Opec called for calm, saying prices were being driven up by geopolitical tensions and that the market was well-supplied with oil. "Opec has noted with concern the strong upward pressure on oil prices of the past few days and wishes to reassure the market of its continuing commitment to order and stability, to the benefit of producers and consumers alike," it said in a statement. But selling was the order of the day as investors worried about the impact of higher oil prices on company profits. The Dow Jones industrial average ended the week down 1% , 106.94 points, at 10,739.35, - its third successive triple-digit loss. Meanwhile the technology-laden Nasdaq closed on a 14 month low. Japan's Nikkei-225 index fell 252.71 points, or 1.67%, to close at 14,891.37 while shares were also well down in London, Paris and Frankfurt. "This past week has been chock full of geopolitical tensions, rising oil and just a handful of earnings reports that really have been uninspiring," said Leo Grohowski, chief investment officer of U.S. Trust. "Nobody wants to wake up to that."